Jennie Goldstein was one of the foremost Yiddish theater tragediennes, beloved by the public and acclaimed by critics for her ability to make audiences cry and for her outstanding voice. Jennie Goldstein was born in New York City on May 8 in 1895 or 1897, the daughter of Samuel and Beckie (Schaffer) Goldstein. She attended the local public schools and Hebrew school, and studied music privately. Although not from a theatrical family—her father was a butcher—she debuted at age six in the role of the child in Hanele di Neytorin [Hanele the dressmaker]. At age thirteen, she left school and began to play adult roles and to perform in vaudeville, where she met Max Gabel, whom she married when she was sixteen years old. Gabel wrote melodramas with titles such as Alts far Libe [Everything for love], in which the couple starred. These plays were very successful and enjoyed extended runs. 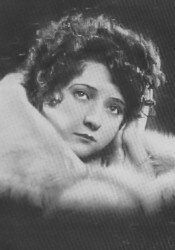 Goldstein was divorced from Gabel in 1930 and embarked on a new period in her career. She managed the Prospect Theater in the Bronx in 1932–1933 and starred in the Yiddish film Two Sisters (1939), her sole movie performance. She married Charles W. Groll, a lawyer, in May 1936. 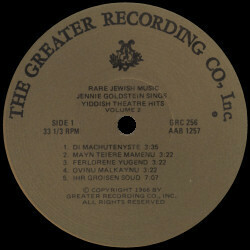 During the 1940s, as opportunities in the Yiddish theater waned, Goldstein transformed herself into a comedienne. She became a popular entertainer at Jewish organizational functions, performed in two Broadway shows in the 1950s, and appeared on television. Interested in Jewish communal life, she was a member of the board of the Bikur Cholim Convalescent Home and a member of the Daughters of Israel Day Nursery and the Hebrew Actors Union. Jennie Goldstein died in New York City on February 9, 1960. During her lengthy career, she demonstrated great versatility in her acting styles and remarkable resilience.